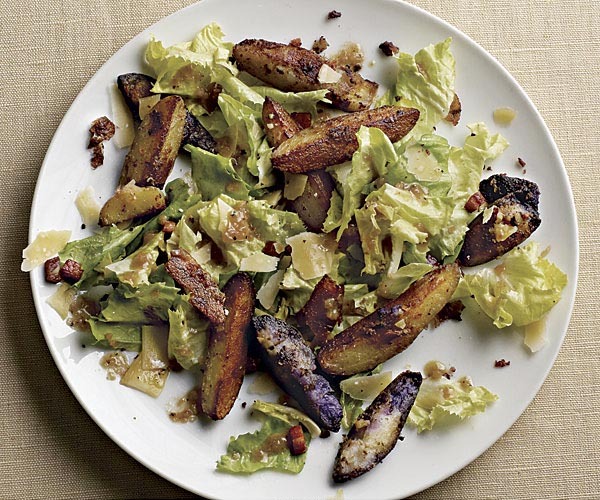 The escarole holds up well when tossed with warm potatoes and warm dressing and its slight bitterness is pleasant when paired with robust flavors of pancetta and gouda. You could substitute spinach for the escarole. Smoked gouda would also make a nice change. Serve the salad warm or at room temperature. Four good-sized servings. Adapted from Fine Cooking. Demoed at Brookside March 12 and at US Botanic Garden March 13, 2014. Melt butter in a 10-inch straight-sided sauté pan over medium heat. Add the potatoes and enough water to just cover them (about 2 C). Bring to a boil. Add 1 t salt, cover the pan, reduce the heat to medium low, and cook, shaking the pan occasionally, until the potatoes are just tender, about 8 minutes. Uncover the pan, raise the heat to medium high. Cook, shaking the pan occasionally, until all of the liquid has reduced to a glaze and the potatoes are lightly browned, about 20 minutes more. Meanwhile, heat a nonstick skillet, add 1 T olive oil and when oil gets a sheen to it, add the pancetta. Stir occasionally until crisp, 6 to 8 minutes. Remove and reserve. Add the shallot to the pan and cook, stirring, until tender, about 2 minutes. Stir in the vinegar and mustard and cook until the mustard is smooth, 30 seconds to 1 minute. Remove from heat and gradually whisk in 3 T olive oil. Season to taste with salt and pepper. Put the escarole and pancetta in a large bowl and toss with 3 T of the vinaigrette. Season to taste with salt and pepper. Divide the salad and the potatoes among 4 salad plates and sprinkle with the cheese. Drizzle with the remaining vinaigrette and serve. This entry was posted in Recipes, Recipes from Adrienne's pantry, Salads, Vegetarian and tagged escarole, gouda, mustard, pancetta, potatoes. Bookmark the permalink.